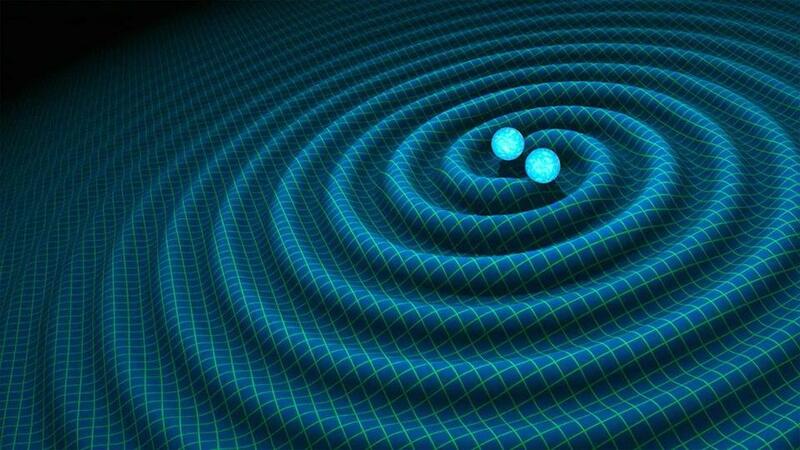 An artist&apos;s impression of gravitational waves. Last Thursday, I was in a room with Albert Einstein — because I was with a dozen scientists from the Laser Interferometer Gravitational-Wave Observatory, and Einstein was as present for them as if he had dropped by to check their calculations. He would have enjoyed himself, because the LIGO team was announcing the first direct evidence of a phenomenon he predicted a century ago: gravitational waves. The announcement demonstrates, on a grand scale, why and how human beings pursue deep scientific questions — and why it matters. The LIGO announcement tells two compelling stories. First, the scientific one: that with his theory of general relativity, Einstein correctly predicted the behavior of gravitational waves, space-time ripples that travel to us from places in the universe where gravity is immensely strong. Those rippling messages are vanishingly faint; until now, they had defied direct observation. Because LIGO succeeded in detecting these faint messages — from two black holes that crashed together to form a still larger one — we have remarkable evidence that the system behaves exactly as Einstein foretold. With even the most advanced telescopes that rely on light, we could not have seen this spectacular collision, because we expect black holes to emit no light. With LIGO’s instrumentation, however, we now have the “ears” to hear it. Equipped with this new sense, the LIGO team encountered and recorded a fundamental truth about nature that no one ever has before. And their explorations with this new tool have only just begun. That story extends to the scientific creativity and perseverance of Rainer Weiss, professor emeritus at MIT and instigator of the LIGO project, and his collaborators at MIT, Caltech, and elsewhere. Working for decades at the edge of technological possibility, against the odds, Weiss led a global collaboration to turn a brilliant thought experiment into a triumph of scientific discovery. That narrative includes the dozens of peer scientists as well as administrators from the National Science Foundation who assessed the merits of this ambitious project and determined the grand investment was worth it. The most recent chapter recounts the LIGO team’s scrupulous care in analyzing and presenting these findings. Through the sacred step-by-step process of peer-reviewed publication, they brought us the confidence to share this news — and they opened a frontier of exploration. Their discovery embodies the paradox of fundamental science: that it is painstaking, rigorous and slow — and electrifying, revolutionary, and catalytic. Without basic science, our best guess never gets any better, and “innovation” is tinkering around the edges. With the advance of basic science, society advances too. That’s important to understand, because if this nation wants the results of basic research — the great discoveries, new technologies, cures, inventions, and wealth — then we have to pay for it. The United States has a time-tested way to make those sustained investments. Confronting the terrible challenges of World War II, President Franklin Roosevelt consulted outstanding scientific advisers, including Vannevar Bush, former dean of engineering at MIT. Together, they developed and pursued a wartime strategy of advanced scientific R&D, which ultimately produced the technologies that ended the war. Federal support for basic research was a big, brilliant idea. By 1950, Congress and President Truman turned that idea into the National Science Foundation. Across the country, federal investments reinvented American universities as powerhouses of scientific and technological research; ideas that flowed from academic labs fueled one innovation wave after another, and helped deliver huge gains in employment and productivity. Today, the NSF funds about a quarter of federally supported basic research conducted by US colleges and universities, including almost 40 years of support for LIGO. This distinctive American system for supporting great science is a vital source of our nation’s strength. And, as Americans, it is something we should be deeply proud of. That system belongs to all of us. And in that sense, LIGO’s historic discovery belongs to all of us too. L. Rafael Reif is the president of MIT.